Tomatoes may be a summertime staple, but you can turn them into an autumn (or anytime) treat by making Spiced Tomato Jam. In this recipe, traditional tomato flavor is warmed by the addition of allspice, cinnamon, and cloves, sweetened by sugar, and brightened up by lemon rind and juice. The lemon juice also helps make sure the acidity is where it needs to be to get a good gel. 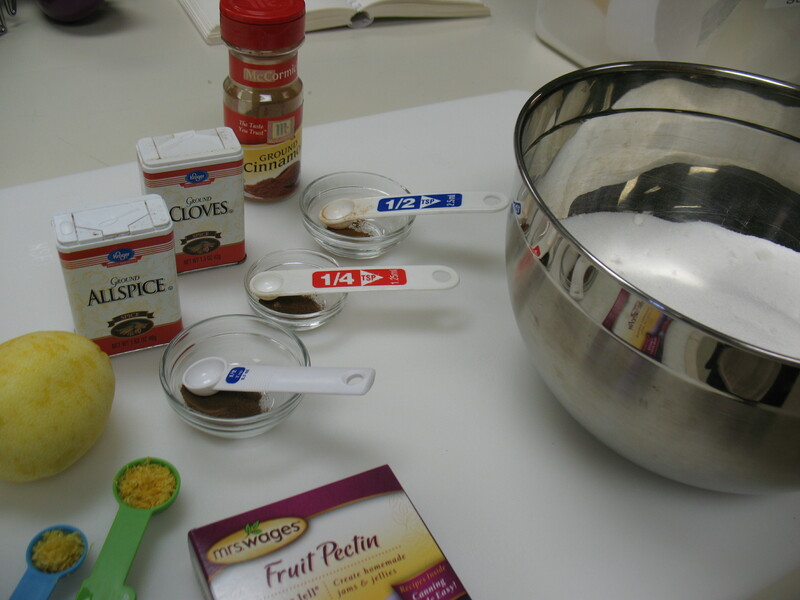 In addition to the ingredients mentioned, you’ll also need a box of powdered pectin. Peeling tomatoes may seem like an unimportant extra step, but the texture of the skin was determined to be undesirable and product testing did not include considerations of how the skin would alter the final product safety. So, scald, peel, and chop tomatoes as described in the procedure. Our canning recommendations are meant to be followed as written, since that is how they were developed and changing ingredients or steps may influence not only the quality but also the safety of the final product. Complete recipe, procedure and boiling water canning process times are on the NCHFP website: Spiced Tomato Jam. People also sometimes ask if they can use commercially canned tomatoes in our tomato recipes, but quantity, consistency, and even acidity could be different in commercially canned tomatoes as compared to fresh tomatoes, so we do not recommend using them when fresh tomatoes are called for in a canning recipe. Wondering what to do with tomato jam? Try serving it on a crackers and cheese platters, smothered over baked brie, or as a condiment with meat dishes. It’s also nice to taste simply spread on toast! 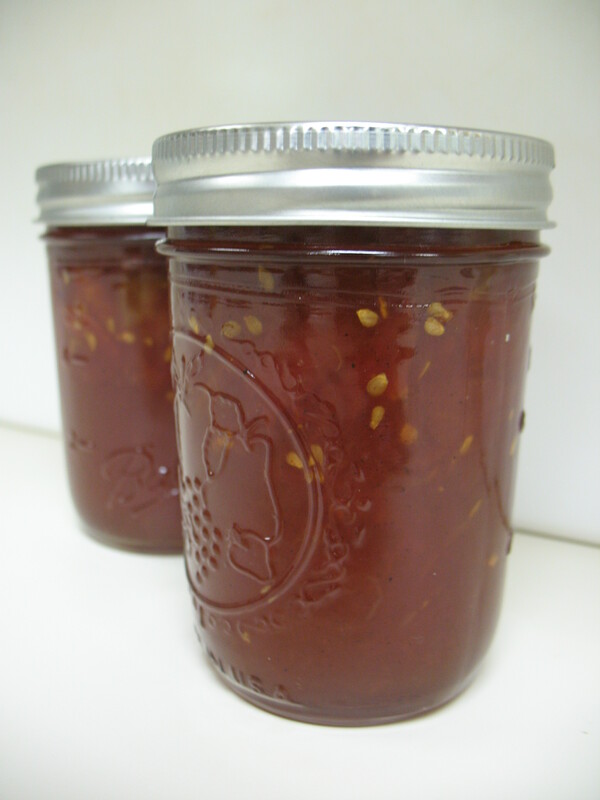 This entry was posted in Canning, Jams and Jellies, Recipes, Seasonal Food Tips and tagged canning tomato jam, canning tomatoes, tomato jam on August 19, 2015 by nchfp. Is it possible to use a low-sugar/no-sugar pectin and less sugar in this recipe? Our advice is to follow the recipes and canning processes that come with whichever low- to no-sugar pectin product you purchase, and to direct questions regarding the recipes and testing of recipes to that company. We do not recommend making your own low-/no-sugar jams by altering traditional jam recipes. Jam and jelly recipes need to be followed exactly to get a gelled product. Traditional gelled products require a balance of fruit, acidity, pectin, and sugar to make the gel structure that characterizes jams and jellies. The gel-structure binds up water so it is not available to microorganisms, so it has a preservation effect and does play a role in the safety of the final, canned product. And we do not recommend guessing at a boiling water canning process for your own recipes due to the risk of spoilage and food sickness. The best way to make a true gelled jam without added sugar is to purchase and use the directions with a no-sugar needed pectin. The directions and recipes are on the inserts in the pectin packaging, and you can also find examples on the company websites. It is worth pointing out too that jams and jellies made without table sugar are expected to last substantially less than the one year shelf life suggestion for best quality of traditional jams and jellies. This is because table sugar itself has a preservation effect on the product, so it just does not hold up as well without it. If you notice mold or off-odors in the product, discard the entire product.